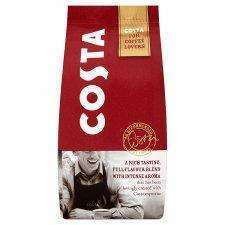 Previously posted back in September, the Tesco £2.00 Costa Roast & Ground Coffee deal is back. Price Drop from £3.49 (valid until 13/11). Good find... Hot for me! But did you mean roast? Or is this road and ground a new blend? They should give it away... Costa = crap coffee! This seems to have constantly been on offer for £2 in one supermarket or another for months now. Alright coffee for everyday use ( it fills a gap in my coffee supply at work in between Illy deals). I bought this in Sainsburys recenetly for the same price - to try it out. Im not sure why ground coffee is so popular, once ground it looses its freshness very quickly. If buying roasted coffee I always buy whole Beans or even better Green Beans and roast on demand. Im not sure why ground coffee is so popular, once ground it looses its … Im not sure why ground coffee is so popular, once ground it looses its freshness very quickly. If buying roasted coffee I always buy whole Beans or even better Green Beans and roast on demand. Waste of time unless you live in a warm climate, you will find you will produce next to no fruit. I know, Ive tried. I have an artificially climate controlled dome in my back garden to facilitate the growing process - I don't even lose the freshness on the walk back to the house because I use a small environmentally friendly wind powered land yacht to expedite my journey. I tried this last week, it tastes rubbish ... anything but coffee. So do I, but not for this price. I use an online supplier called Hasbean hasbean.co.uk/ which sells freshly roasted foffee beans to order. My personal favorites are their South American coffee beans, but at upwards of £5.00 a bag (+ P&P) they are not the cheapest....but you pay's yer money!. It doesn't taste like coffee??? Ehh? So do I, but not for this price. I use an online supplier called Hasbean … So do I, but not for this price. I use an online supplier called Hasbean http://www.hasbean.co.uk/ which sells freshly roasted foffee beans to order. My personal favorites are their South American coffee beans, but at upwards of £5.00 a bag (+ P&P) they are not the cheapest....but you pay's yer money!. I know what ya mean. Sometimes pre-ground tastes like you've actually put sort of coffee flavoured cardboard pieces in your machine. These deals always bring out the coffee snobs. £2 for a perfectly drinkable coffee is a good deal. It is certainly not the best but I would like to read some suggestions re where you can get better for the price. These deals always bring out the coffee snobs. £2 for a perfectly … These deals always bring out the coffee snobs. £2 for a perfectly drinkable coffee is a good deal. It is certainly not the best but I would like to read some suggestions re where you can get better for the price. For someone like me its not drinkable. I'm not a coffee snob, I just find stale coffee very unpleasant and I think fresh coffee is amazing. It depends on your idea of decent. For those of us who don't have the luxury of grinding our own beans and percolating the perfect cuppa in our krupps machine during a busy day in the workplace, something like this is ideal. Chuck it in a cafetiere give it a couple of minutes, chuck it down your neck and get on with it. Job done. I wouldn't serve this stuff to guests at home, but the coffee I would serve them would cost at least three times this. It's all relative. It depends on your idea of decent. For those of us who don't have the … It depends on your idea of decent. For those of us who don't have the luxury of grinding our own beans and percolating the perfect cuppa in our krupps machine during a busy day in the workplace, something like this is ideal. Chuck it in a cafetiere give it a couple of minutes, chuck it down your neck and get on with it. Job done. I wouldn't serve this stuff to guests at home, but the coffee I would serve them would cost at least three times this. It's all relative. I partially agree to what you are saying but if people find this coffee as bad as they say then do then its not a good deal and another run-of-the-mill two quid jobbie should be sought. Is this not a deals site? If someone does not find this a deal surely they should be free to voive their opinion on it without being labelled a Coffee Snob? I can buy Green bean delivered for less than this price but obviously I have not factored in the price of a Home Roaster and Grinder nor the machine to make the coffee. Although they are now all over three years old so I figure they have paid for themselves by now. Home roasting is something every Coffee aficionado should look into, you'd never go back to stale Pre-ground I can assure you. I partially agree to what you are saying but if people find this coffee … I partially agree to what you are saying but if people find this coffee as bad as they say then do then its not a good deal and another run-of-the-mill two quid jobbie should be sought. Is this not a deals site? If someone does not find this a deal surely they should be free to voive their opinion on it without being labelled a Coffee Snob? I can buy Green bean delivered for less than this price but obviously I have not factored in the price of a Home Roaster and Grinder nor the machine to make the coffee. Although they are now all over three years old so I figure they have paid for themselves by now. Home roasting is something every Coffee aficionado should look into, you'd never go back to stale Pre-ground I can assure you. Can you give some examples of pricing on green beans and how long you can store them pre-roasting? Also could you provide an idea of a reasonable roaster for someone that drinks a couple of cups/day (only one in the house who drinks it). Just trying to get an idea of how much more involved it would be then my current prepackaged coffee going into a bean to cup machine. Aficionado / snob - potato / potahto. Why come onto a deal for a bog standard cheap coffee and start waxing about roasting your beans etc I am a bit of a whisky afocionado/snob but I wouldn't go onto a deal for bells whisky and tell people not to buy it because a Tomatin 18yo is better - actually history may state otherwise, I do get on my high horse sometimes as well :-). I don't have an issue with people who are passionate about coffee (or anything for that matter) but don't force it onto people who don't share your passion. It is a £2 drinkable coffee that has almost 300 degree heat suggesting a lot of people like it. Right now where is that Bells deal. Aficionado / snob - potato / potahto. Why come onto a deal for a bog … Aficionado / snob - potato / potahto. Why come onto a deal for a bog standard cheap coffee and start waxing about roasting your beans etc I am a bit of a whisky afocionado/snob but I wouldn't go onto a deal for bells whisky and tell people not to buy it because a Tomatin 18yo is better - actually history may state otherwise, I do get on my high horse sometimes as well :-). I don't have an issue with people who are passionate about coffee (or anything for that matter) but don't force it onto people who don't share your passion. It is a £2 drinkable coffee that has almost 300 degree heat suggesting a lot of people like it. Right now where is that Bells deal. So what you're saying is that your a Whiskey Snob? Each to their own I guess? I quite like a wee snifter of Whiskey myself, so much so that I am a member of a Club here in Scandinavia. I have never clicked and commented on a Bells Whisky thread as I have no intention of drinking it but I was intrigued by this offer as I have never tried I thought Id have a look as Id most likely have bought a few when Im in the UK for in the office or off-shore. Always nice to have a supply of pre-ground if its decent as its practical for carrying around. But from the reviews here Id give it a miss. There's better offers for £2.00. But I see nothing with highlighting the fact that pre-ground coffee is just one step up from Instant and Green Beans are readily available on-line and cheaper than this. So for those who have not tried fresh roasted beans then you really should, its well worth he effort and time.